The fall was so lovely up in Canada last month. I was enchanted by the rich orange and golden colors of the marshes around Baie Verte, compared to their greener colors of the summer. I wanted to be able to paint some pictures showing those colors! Last night I made an attempt. 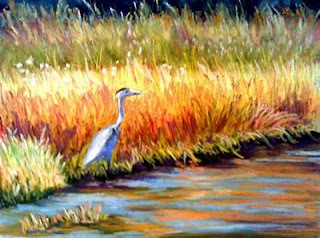 I got a lucky photo of a Great Blue Heron in the marshes my last day there, and decided to use that as the reference for my painting. As is common for me, this was done on 9x12 Art Spectrum.